Cpanel is now included on specified Unix Web Hosting accounts. Automatically configure Outlook Express to receive e-mail. Full Control - Cpanel allows you to take control of your website. You can now do things from your browser that used to require telnet access or a call to your web hosting company's support center. Many web hosting companies simply will not allow you the amount of control over your own website or can't support all of the features available with Cpanel. Web Based E-mail - One of the most popular features of Cpanel is the ability to check your e-mail from the web. You no longer need to set up outlook or Netscape to retrieve your e-mail. You can fully manage it right through your browser from anywhere in the world. This is very useful for professionals on the go, or simply for the ability to keep up with your e-mail while traveling or on vacation. E-commerce - Why search endlessly for the perfect shopping cart software, and then spend hours or days trying to install it? 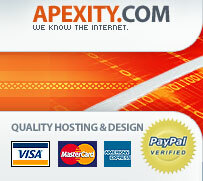 Cpanel includes 3 extremely versatile and powerful shopping carts. osCommerce Agora and Interchange. Installation is as easy as the click of a button, and takes less than a minute. All 3 shopping carts are compatible with most major payment gateways such as Authorize.net. As an added bonus, osCommerce is fully integrated with Paypal. Community - Everybody knows that one of the best way to encourage repeat traffic is to provide a community for your visitors. That is why Cpanel supplies several community building scripts including a full featured MySQL based bulletin board forum with your web hosting account. The MySQL backend means that your forum can handle unlimited posts and members, so you will never outgrow it. Just like with the shopping carts, installation takes seconds, and anyone can do it. We also have several advanced scripts such as PHP-Nuke one of the most powerful community building scripts available. PHPauction will give you all of the advanced features you need to start your own auction site. Don't spend hours downloading, uploading, configuring, and testing these programs, all of our advanced scripts can be installed on your site with a click of the mouse. Stats - Tired of trying to guess how many people visited your site? Do you need to know how visitors are finding your site? Cpanel includes popular statistics programs Webalizer and Analog. Both are full featured graphic stats programs, and using both together will give you more control over your marketing efforts. Your hosting account also comes with access to raw log files for the ultimate in control. Multiple Users - Do you have multiple employees or designers that each need a managed FTP account? Cpanel provides an easy way for you to manage your design team allowing each to access your site with a unique username and password. You may assign temporary FTP access to an outside designer or programmer, then remove their access in order to maximize the security of your website. Our advanced scripts even include PHProjekt, a collaboration program which will allow you to assign tasks to each member of your design team and track their progress. Easy Backup - If you have ever lost data you will appreciate the security of browser based backup. With Cpanel you can back your data up right through your browser and save a copy to your local hard disk to restore later in case of emergency. This allows you to backup on your schedule and restore your website without any assistance. Full documentation - Cpanel comes with full documentation available right in your control panel. The instruction manual is fully indexed and easy to navigate. It includes easy, detailed instructions for performing every task available in you web hosting control panel.